NOTE: Tandoori Grill’s lunch buffet strongly redeems the quality of their food that is portrayed in this post. For an Indian restaurant located directly next door to an Indian grocery store, Tandoori Grill definitely missed the spice aisle. I used to always pass this place and disregard it for no reason, but I finally decided to give it a shot. I walked in and was immediately surprised by a great restaurant atmosphere serving what seemed to authentic Indian cuisine. People (or in retrospect maybe just a bunch of actors) even seemed as if they were enjoying some Indian food. With a complimentary serving of paratha (chickpea + cumin prepared like a chip) and some kind of tomato based sauce, I teased my hungry stomach with an Indian version of chips and salsa. 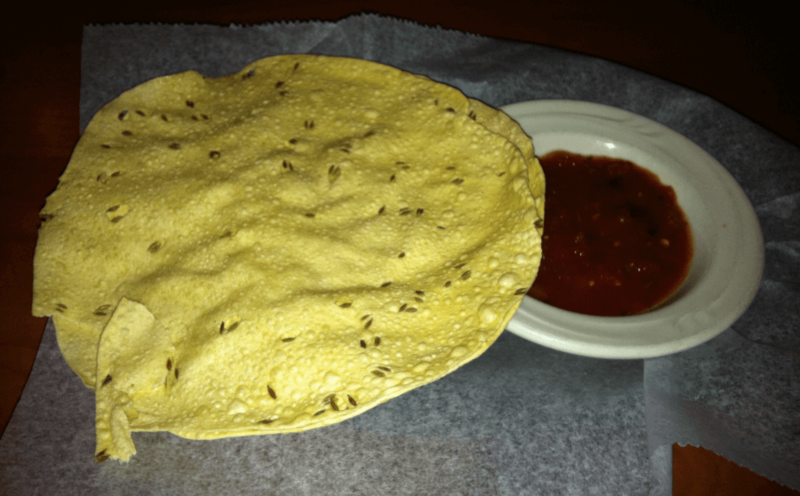 Well, at least it would have been if the sauce didn’t actually remind me of salsa…but at least the paratha was good. 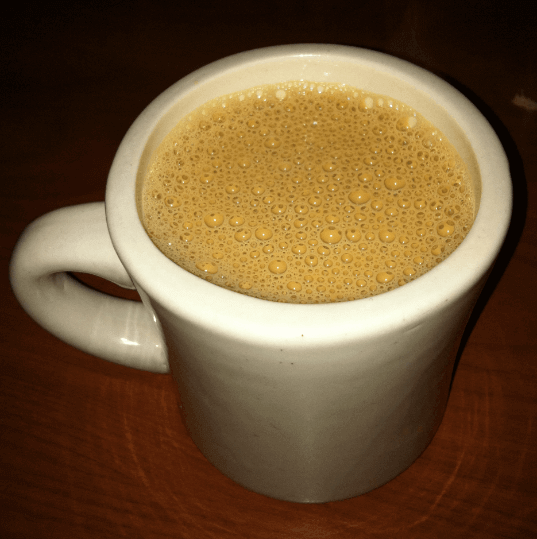 I always order a hot chai tea [$2.50] when I go out for Indian food, and it’s pretty uncommon for me to ever reject a free refill of anything that’s not water. I surprised myself when the waitress offered to top my cup off, and I declined. The tea was as weak as Courtney Love’s mental stability. 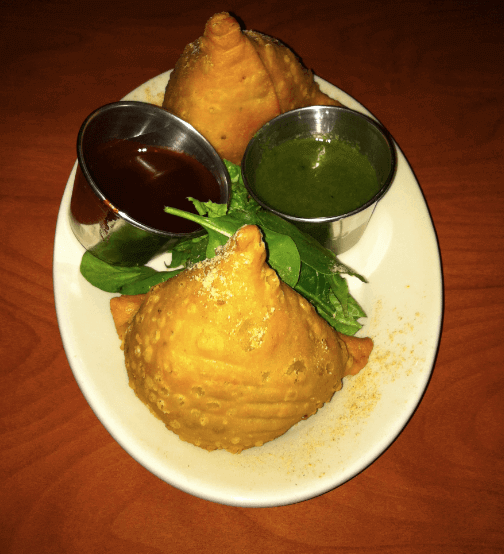 I got an order of some samosas [$3.99], a classic Indian starter that even Tandoori Grill could pull off. The crispiness of the fried pastry shell crunched perfectly into the fluffiness of the flavorful potatoes and peas on the inside. Mmm. It was accompanied by two sauces: tamarind sauce (it actually tasted like tamarinds) and some mint chutney (it actually tasted like a puréed cucumber). 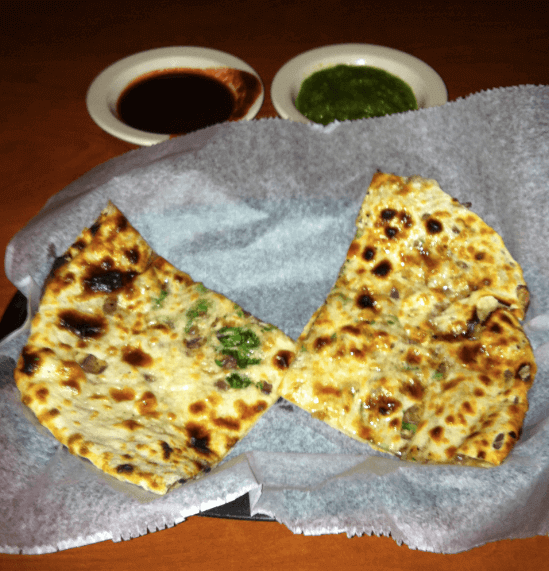 I love onion naan, so it only seemed appropriate for me to get Tandoori’s equivalent: onion kulcha [$2.99]. This was also served with copious amounts of the tamarind sauce and the “mint” (cucumber) chutney. Granted it was a little doughier, I really didn’t understand why this wasn’t onion naan. Since I really liked it, I’ll accept the Indian kulcha for what it is. The Kabob Sampler [$8.99] was the order that I was most excited for. I wasn’t really surprised when this dish was also served with the same two sauces as the two previous dishes (I already had plenty still leftover), but I was surprised by the lack of spice. While its presentation seems to be quickly thrown together by a hurried 4-year-old, this dish consists of ginger chicken (the white one), chicken tikka (the orange one), and lamb boti. Although the chicken was really moist and juicy, it just tasted like good chicken. There was by no means any real chicken tikka on my plate, and was by far and away the most mildly prepared Indian style meat I have ever had. At one point when I was chewing the chicken tikka, I thought I might have tasted an aftertaste of a spice, but I’m pretty sure it was only in my hopeful imagination. The ginger chicken was the same exact, and the lamb was equally as disappointing in it’s own chewy/uncuttable way. It is possible I burned my tongue on the scorching hot chai and couldn’t taste these delicious spices, but I’m pretty sure that they just weren’t really there. Tandoori does offer a lunch special every day where you can endlessly gorge at their buffet for only $10. Regardless of quality, that’s a good deal and I’ll probably try it. By the by, any non-lunch-buffet meal cost just as much for the same amount of food at Himalayas (next to the Boulder Theatre on 14th/Spruce), which is much more authentic and can fill anyones spice preferences. are you freaking kidding me!? you need to go back ASAP..First of all: Indian food is never, ever known for their presentation (there are not many Indian places you will find with awesome presentation) so I don’t think you can can hold it against them. If you were at a four or five star restaurant that boasted its atmosphere, like Frasca or The Kitchen, then you can judge. But, PLEASE, you need to quickly figure out what are the appropriate judgements for the specific restaurants at which you are eating. Not only that, but this is one of the best Indian food restaurants in Boulder, and it is damn good. so go back, order curry (duh!) and do it again. Thanks Ali. The presentation critique was a very small part of my review, and it was only ancillary to the unpleasing meat dish that was prepared tandoori-style. I’ll keep what you said in mind, though. I’m sorry to disappoint, but I’m glad to hear there are good experiences at Tandoori Grill. I’m going to try out their lunch buffet, like I said, and I’d be happy to give them a second shot at that in person and on Bite Into Boulder. Although I love curry, I find it to be a stereotypical way to ‘grade’ an Indian place, so I was trying to branch out and see what else they had. To me, (besides their samosas) it wasn’t much…I guess to find what I’m looking for I’ll have to try their curry. Thanks for the recommendation. Stay posted for a buffet post. In the meantime hit up Himalayas. Inspired by you, I returned to Tandoori Grill today to try out their lunch buffet, which I’ll be reviewing as a separate-but-related post to this one. Stay posted for it, and whatever comes in between. Cheers! I’ve gone to Tandori more times than I can count and they’re AMAZING. I don’t eat meat, and they have a billion different veggie meals. Next time try ANY of their curries– scratch that try ALL of their curries. Wonderful. 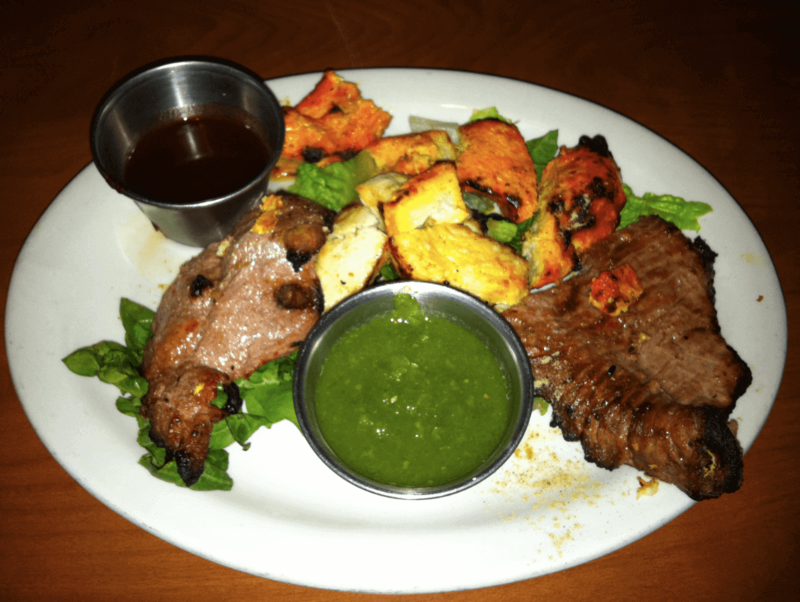 I used to be a vegetarian too, and let me tell you…the kabob sampler almost re-converted me. It seems to be the word around town: Tandoori Grill has amazing curry. Next time I go is today, so I hope their lunch buffet has some good curry choices, or at least something of that sort. I don’t think I can stomach a billion different curry dishes, but I’ll definitely give some of them a try. I look forward to experiencing what you seem to praise so strongly. Thanks for reading! Stopped by Tandoori Grill today for their lunch buffet and got a pretty diverse taste of what they have to offer. Thought I’d let you know I’ll be reviewing their lunch buffet as a separate-but-related post to this one. Stay posted for it, and whatever comes in between. Cheers!